I've been natural for almost 7 years, and I have come to realize that it's not the product that makes your hair grow, but the technique. For almost 7 years, I have stuck with the same products that works for me. Hair products can definitely add up and I didn't want to break the bank buying products for my hair. The goal was to keep it simple! I chose to stick to a sulfate free shampoo, rinse out conditioner, deep condition conditioner, natural oils, and a leave in conditioner and that was it. Within months, I saw my hair growing at a speed I never thought could happen. With that being said, I didn't have a special product that automatically grew my hair, but what made it grow is the technique I used. I was gentle with my hair, limited the amount of heat, and kept it moisturized daily. If you're overwhelmed with all the products, just stick to what works best for your hair. If you feel your hair is moisturized and easy to detangle, then that's the perfect product for you. 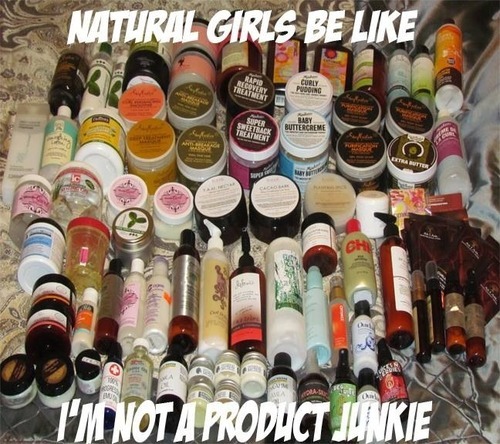 It's okay to try new products, but there's no need to become a product junkie. At the end of the day, it's the technique you use to grow healthy hair.